Sen. Bob Menendez was spotted on the beach at a resort in Puerto Rico on Day 22 of the partial government shutdown, and he was promptly criticized over the optics of vacation in the midst of a national crisis. Menendez was among 30 Democrats in Congress attending a gathering in San Juan sponsored by Bold PAC, the campaign arm for the Congressional Hispanic Caucus. The delegation of more than 30 members is in Puerto Rico for the Bold PAC convention and a summit hosted by the Latino Victory Fund, a progressive organization dedicated to increasing Hispanic political participation. The congressional Democrats met with Puerto Rican officials and engaged in frivolity with at least 109 lobbyists, who participated in the event. A Fox News producer, David McAlpine, posted an image of Menendez on the beach standing with his hand out in front of a bikini-clad woman. “One of the reasons was to show that going to Puerto Rico means that you’re helping fellow Americans and you’re helping the American economy and in addition to that, the more important side than that is making sure that we came to see for ourselves what is the condition of Puerto Rico. How bad is it? And it’s bad,” said Rep. Tony Cárdenas (D-Calif.), Bold PAC’s chairman. Some Republican criticism was centered around the fact that actor and producer Lin-Manuel Miranda timed the premiere of an original-cast run of his hit Broadway musical to start over the weekend. Numerous reports say lawmakers attended a Sunday performance of Hamilton. Congress appropriated more than $18 billion for Puerto Rico disaster recovery in community development block grants managed by the Department of Housing and Urban Development, but little of that funding has made its way to projects on the island. Menendez said he learned during policy discussions on Saturday, about friction between labor and government in implementing a $15 per hour minimum wage package. In a memo welcoming the guests to the seaside resort, 109 lobbyists and corporate executives were identified. Among them were members of some from prominent Washington firms as well as representatives from R.J. Reynolds, Facebook, Comcast, Amazon, PhRMA, Microsoft, Intel, Verizon, and unions like the National Education Association. 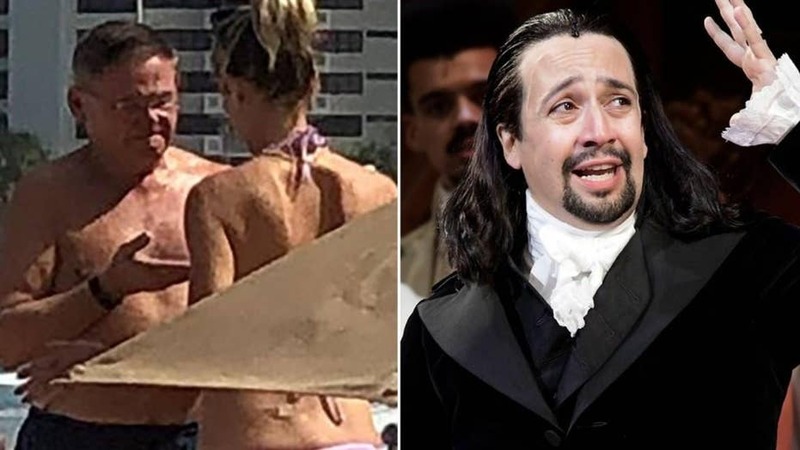 The woman wearing a pink bikini, who is apparently with Menendez on the beach, was not identified. “Ordinary citizens have the power to take control, by joining like minded residents who have had enough of ‘politics as usual,’ by running for office in primary elections and by asserting our responsibility as the masters of our democracy,” said McCormick, who said people can learn more by visiting her website and signing up as a candidate or volunteer.